The enduring appeal of traditional jewellery is captured in our Luckenbooth designs. The Luckenbooth is one of the most romantic Scottish symbols of love, from the 17th century and often given as a token of betrothal, affection and friendship. It is usually in the shape of a heart or two entwined hearts, symbolizing love, with a crown, symbolizing loyalty, topping the heart(s). In addition, a couple may pin a Luckenbooth to their firstborn’s blanket as a good luck charm. During the sixteenth to eighteenth centuries there were two main styles of brooches in Scotland; one was the ring brooch, often with incised decoration, and used to fasten plaids by both men and women. This design was called a Pennanular. The other brooch was a heart shaped one, often given at weddings and engagements as a token of love. From the eighteenth century onwards, small plain heart shaped brooches were worn to protect against evil spirits, the evil eye or the attention of the sithean (fairy spirits). These are the famous “Luckenbooth Brooches”. The name for the Luckenbooth came from there being sold in locked booths. These were small shops, which were in fact very tiny and could be securely locked at night and were a feature of Edinburgh’s Royal Mile. These brooches were heart shaped surmounted by a crown and usually made of silver. The first Luckenbooth brooches date from the late seventh century. This traditional gift was given by a man to his sweetheart on their betrothal. It was considered a lucky charm, protecting the wearer against the evil eye. Among other powers the Luckenbooth was supposed to have, was in easing the pain at childbirth and ensuring a good flow of breast milk when it was pinned to a woman’s petticoats near her left thigh. If pinned to the baby’s shawl, it would protect the child from being stolen by fairies. During the XVIII and XIX centuries the Luckenbooth became larger and more elaborate with inscriptions on the back such as biblical references or the initials of the couple and the date of their betrothal. From 1850 onwards, the intertwined hearts were made to resemble the letter M. These came to be called Mary’s Brooches or even Holyrood’s Brooches for Mary Queen of Scots’ whose husband, Lord Darnley, had given her one. 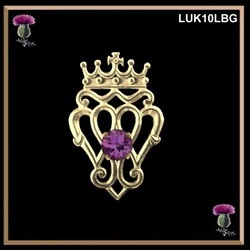 Most Luckenbooth brooches today are in the form of two hearts topped by a crown and are made of silver, although some versions of this traditional Scottish brooch can be found in iron and brass. Victorian ones were generally set with garnets. Garnets were thought to have a lucky influence on affairs of the heart and symbolized a lover’s constancy as well as being an emblem of deep friendship. The Victorian versions of the Luckenbooth brooch were decorated with gems of different colours.